Hrach Garden: Run Your Own Race, unless running someone else's race IS your race. Run Your Own Race, unless running someone else's race IS your race. I try to be a good person. Cheerful, encouraging, because I feel like this world needs it. I am my own worst critic, and this summer was miserable for me for training, because my heart and head haven't been in it. 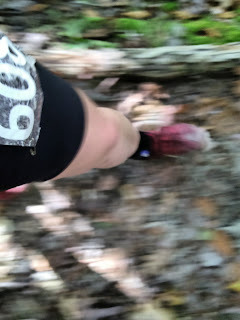 But I was signed up for Oil Creek 100, the 100k distance (that's 62 miles, two loops of the course), and I went into it knowing I would enjoy the time, run with friends, and have no expectations of myself. It was a new way to go into a race, and I think I liked it. 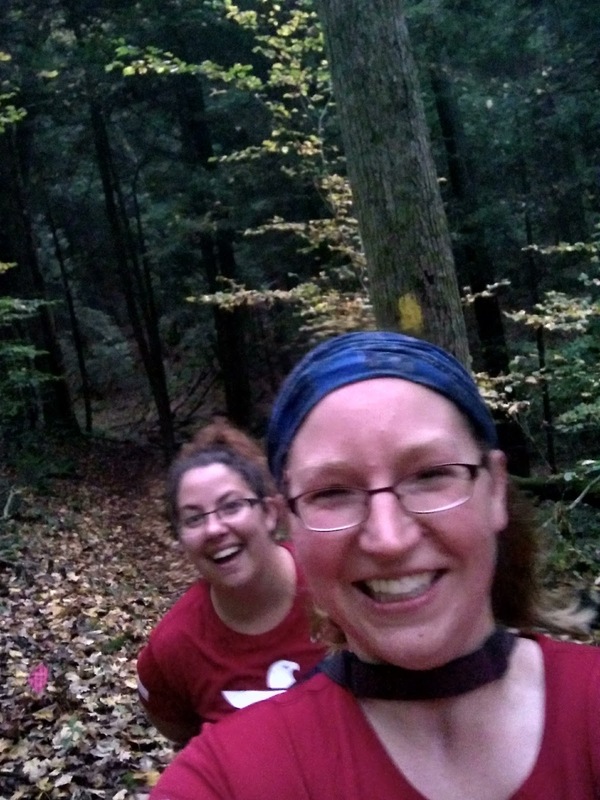 I ran with my friend, Megan, who was attempting her first 100k. I ran the 100k back in 2012, and did a fairly good job back then, but I wanted to be there for Megan and get her to the finish. So we ran, and boy, did we have fun! Smiles most of the day. Night was a different story. Race day always starts early, but I wasn't too nervous until I got down to the school. 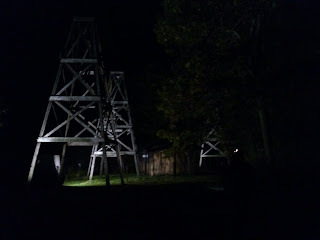 I hugged people and wished them good luck, and Megan and I started in the dark. We whooped and cheered and trotted into the woods. We were taking it slow, because we knew we had a long way to go - it was Megan's first 100k, and the furthest she had ever gone, and we were both slightly undertrained, due to a broken thumb for me, and her having her wisdom teeth out a month earlier, with complications. So we took it slow, and we talked, whooped, high-fived (yes, with my stupid broken thumb, but I learned to switch hands, eventually), and cheered our way through the first loop. Megan and I are both talkers, so the miles went fast. I was eating gels and drinking plenty of water, and checking in with Megan to make sure she was doing the same. I kept checking in with her to make sure she was keeping track of how her feet were feeling as well. I bonked my toes plenty of times, and tripped a dozen times, but caught myself. We took our time at the Aid Stations, fixing feet, getting food, visiting with the amazing volunteers and friends we'd see there. The past year has not been an easy one for me. No health issues, but life issues. And I've learned a lot about me. I've never felt "good" running alone during these events. Never. Not the kind of "bad" as in being in pain or stomach issues. Not the kind of "bad" because the night is cold, or the day is hot or long. I am my own worst enemy in my own brain. But when I'm helping some one, moving someone else forward, I can do anything. When I'm alone on the trail, I get full of frustration at myself, at the things I have done in life that are terrible and wrong, at what I should change to be a better person, and I lose myself in my own self-deprecation in my own head. So running with Megan was a gift, it wasn't a chore. Being her friend and companion, and a little bit of a nag was motivation for me. I have done the best in all my races when someone is with me. Even when it's my race, and have a pacer - I do better when I put it on myself to finish so not to let THEM down. When my Dad paced me for the 100 - pushing for that last seven miles was so I could share those miles with him. I don't know what kind of person that makes me. Maybe I need to be a pacer instead of running these races for "me." One of the best parts of my day was that Eli was there at the end of section 3 the first time through. I heard his little woo down through the woods, and sprinted down to meet him and give him a giant hug. 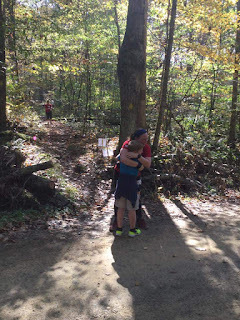 His dad had brought him, and we had been too fast through Aid Station 2 the first time to meet them. Anyway, we made it back to the school aid station in the late afternoon, and the heat was getting to us. I was still running some here and there. My back had started bothering me a bit, but some stretching and a little bit of ibuprofen had worked the kink out. Megan was wilting in the heat, so I was hoping getting back to the school and cooling down would help. The paved bike path hurt, but we made it back. Leafy long trails. Beautiful out there! We took our time at Aid Station 4. I changed clothes and shoes, ate food, drank some pickle juice. After walking around in the shoes I had changed into, I changed back into the others. They hadn't been giving me issues, and the other shoes were rubbing as I walked around the Aid Station. Dave D., Megan's pacer (and a fellow Oil Creek native and friend) was there at the Aid Station with chairs set up for us, filled our bottles, fetched us things, and patched us up for the next leg of our journey. Rob G. was also there helping us out, and waiting for his pacee, Dan W. We timed it out that once Dan came in, we were all ready to leave at the same time. Those next couple of miles on the bike trail were silly and I think just what we all needed. 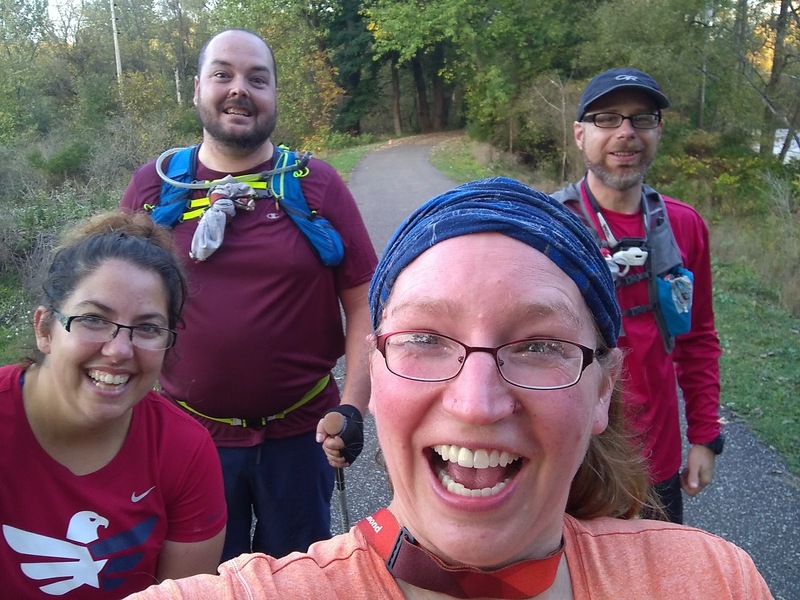 I was feeling slightly off because of the food, but once we hit the end of the bike trail (and portajohn handily placed there), I felt much better, and we hit the trail. We started out together, but Dan wasn't feeling his greatest, and we slowly pulled ahead. We hoped they would catch us eventually, but we didn't see them again, and Dan ended up dropping at Aid Station 1 as his legs stopped working reliably (as we heard later). We slowed down on Section 2. Megan's feet were hurting, and though we were still chatty, I was getting tired, and I'd pull ahead and was watching the ground for wooly bears, and salamanders, and we even saw deer laying in the woods, their eyes shining at us with our headlamps. I think we would eventually count about 9-12 deer in different places in sections two and three. Megan and I were each using one of my hiking poles to make the going a little easier for us. 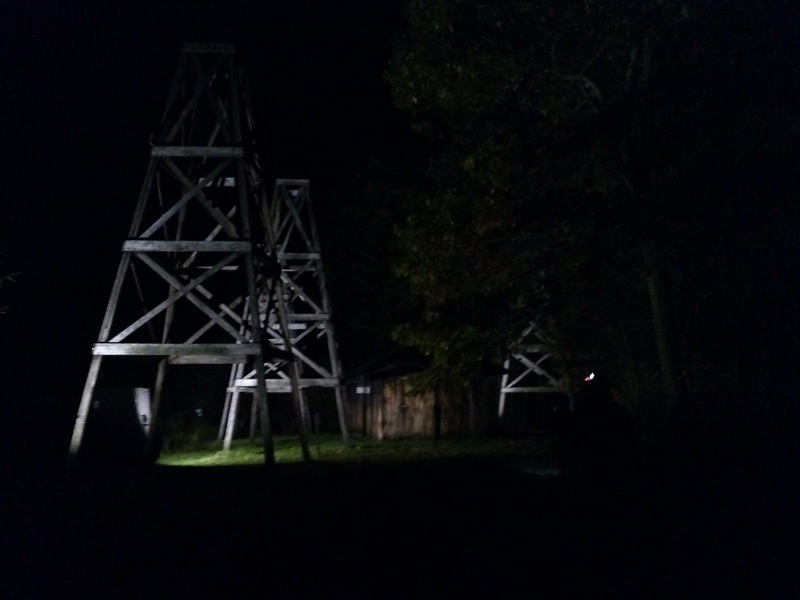 The Derrick Tableau lit up at night. 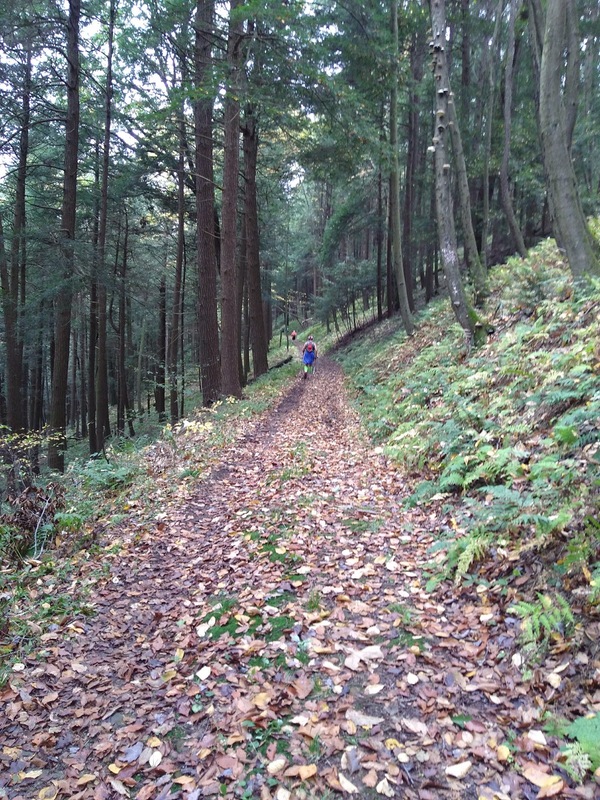 When we got to the last little section before Aid Station 2, Megan didn't think she could walk up the set of stairs. We told her we were getting her up those stairs if we had to carry her. Her blisters on her heels were awful, but we got her up the stairs and through the last bit of trail to the aid station. She was frustrated, because the rest of her felt good, but her feet were slowing her pace to a crawl. As we walked the last bit of road to the Aid Station, I took the time to look up at the stars and breathe in the air. And got yelled at by Dave and Megan who didn't want me to get hit by a car on the road, as I had turned my headlamp off to look up at the stars. I turned my lamp back on, and Megan cursed me (because I could still run) as I ran ahead to tell the aid station what was going on. I kind of stayed back while folks evaluated Megan's feet. Dan's wife Marley had brought us some cheeseburgers, and I actually had the appetite to eat one(in most races, by hour eighteen I'm only eating gels). We found out that Dan had dropped and was back at the school, but I enjoyed the cheeseburger in his honor. Megan made the tough decision to drop from the race, her feet being too painful to wrap adequately to put weight on, and we had nearly 18 miles to go to the finish. I was a little bleary at this point, and sad that she had to quit, but I changed my shirt and shorts (I was having some chafing issue), and I asked Dave if he was going to keep pacing me, and he was. 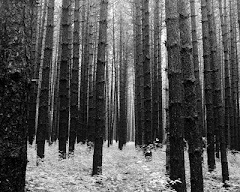 I was glad, since I don't do well in the woods alone with only my inner monologue during the night. I know I hugged Megan and wished her rest and healing as we took off. The up hills were getting harder, even with poles, but on the flats I was cruising, and I was even trotting on some of the downhills. I was sleepy, and Dave and I chatted about everything and nothing and wooed and hollered through the valley as we went. I passed people here and there, and others passed us. I was tired, and I ached, but it was easy to move forward. 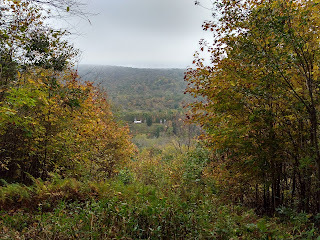 I was enjoying the rustle of the leaves, the wind through the trees, the companionship with my friend, talking easily about work and life, teasing each other, checking in with each other to make sure we were eating and still feeling ok. I'm not sure all the things I talked about as I wandered through the woods, hugging friends that I sometimes only see during this one weekend of the year, settling into this easy friendship and companionship with people that you might not agree with over the dinner table, but that you can be sister or brother to in the woods on the trail. It's like the adventure books, being on this journey, and I don't do it well alone. I don't mind being on my own, but in the woods, I do much better knowing there's someone that I'm depending on, for companionship, than I do arguing with that dark side of me in my head. Even the quiet moments, the silence was not lonely, not empty. It was full. I don't know how to define myself in these moments, but I know I'd be so much less than who and what I am without this crazy community I'm part of. Relentless forward progress. And I have great legs, by the way. We got to the bike trail, then to the school, and I jogged in the last little bit and finished in just under 25 hours. I hugged the race director, I hugged Dave, and I sat down. Dave got me hot tea, and we sat and waited for a couple of our friends to finish. We then found out my good friend, Rog, had taken a bad fall on the trail, and hurt his eye pretty badly and was taken to the hospital. This shook me quite a bit, and though I cheered some folks in, my head was with my hurt friend. Roger has been pulling for me, cheering me on and been my running mentor and friend for a number of years now. We've seen each other during some lows on the trails, and some highs, and I was angry that he was hurt. Angry at what? I couldn't tell you. The trail? The fact that I couldn't turn back time and make him un-hurt? Grief is a funny thing, a sort of funny taste and twisting of your stomach. The part that would have taken his place, that would've fallen instead so he wouldn't have. We found out that he was ok, but the finish for me was not as joyful knowing that some of my friends were hurt, that some of my friends had to drop from the race. There's a melancholy in the end of something, even if it was a success. In the struggle, in the pain, even when it's over, there is a little bit of emptiness. Running this race had a lot to do with me overcoming of my own demons, and being with my good friends through much of it was part of that overcoming. Thank you to Megan and Dave, and Rob and Dan for being with me for a lot of that journey. I'm there for you guys, whenever you need it. I'll read this as soon as we're done with our family re-viewing of The Force Awakens. But I just need to say: "Damn! Your post is longer than mine!!!!" Finally got my read in (and I can close the window on my phone!). Well written. Glad you made it in. I didn't experience 'the negatives', just fatigue. Still getting over the residuall effect of last winter's illness, I believe. Anyway, a race report worth reading. Thanks.